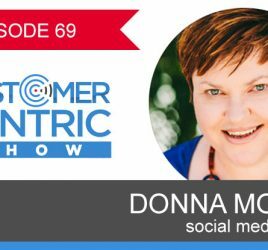 Hello everyone welcome to episode 60 of the customer centric show. Today I am speaking with Dr. Linden Brown who is the author of the customer culture imperative and is also the CEO of market culture strategies. Now during our conversation today Linden is going to be talking about an exceptional story of a customer centric business who actually carries out and made good situation. A business makes and trying to fix that one and they don’t deliver expectations. He also talks about the needs for this after understand the concept of lifetime value of customer and give examples there. How he came to identify that a customer centric culture contributes to profitability and lots of research there. The eight factors to measure and drive sustainable business performance and how in past businesses of his own how he has used collaborative approach to boost competitive advantages. Ritual benefit across target marketing engagement success stories. So much into this interview. It is almost an hour but I guarantee you, you really will find this one valuable. Mel: Hello and welcome to customer centric show. Today’s guest is Linden Brown. Linden is a professor, keynote speaker and an author who works with businesses around the world to improve competitiveness through the adoption or market centric values practices and skills. Linden’s business market culture strategies offers benchmarking, skills assessment and strategic planning for teams that results in measureable improvements in sales growth, profitability and customer satisfaction. Linden is also the author of customer culture imperative, a book that won marketing book of the year in 2015 and it is a book that knocks secrets used by businesses like amazon, virgin, apple, starbucks. It creates insights of more than 100 businesses to identify seven key factors for success. I am very excited to be speaking with you today Linden. Thanks for joining me on the show. Linden: It is a pleasure Mel. Mel: Now we start the show by asking every guess what an example of a customer centric business is that you have experienced yourself. Do you have a story that you can share with us? Linden: Look I got call few stories Mel but I will start with one and this is of a company in United States called Zain Cycles and they operate over in candidate in eastern state of the US. A bike retail operation. So essentially they sell sakes and Chris Zane who started this business about 25 years ago is a real example of customer centric leader and he has been able to get that culture through entire business. He only has one store but he has probably have 30-35 people in this business and a lot of his business is down online as well as through the shop that he actually has and I think that what he said to me was the test of a customer centric business is what you do when things about what particular customer could share a load to the shop on one occasion and said look I want you to decorate this and pick it up for my husband he love cycling and I want you to have it in the window so when I come out with my friends and husband I will surprise him by taking him across the road and show him the bike in the window. Of course what happened was that I forgot to put the bike out. So when over there of course she was ready to spring the surprise but didn’t happen. The very next day they said well what can we really do about this? Well quite a few things we can do and we should do. The first thing that we should do is to forgive the 50 percent payment. So she paid 400 dollars and there was another 400 to pay and they said well we want you to pay that. We made a mistake and we feel bad about it and we want to fix it. But also they realized that there was an emotional element to this and so they offered her tickets to the movies for some of her friends and also for them to go back to that restaurant with Zane cycles actually paying the bill for two of them. So there are number of things that they actually did and they didn’t do it up by fun, their store manager went down to where she actually lived and personally told that this is what we are going to do and was telling me that this guy went back and said you want the lead and she actually kissed me so the customers overcome with the response of the company and I think the thing that really reflected the culture in this around the customer centricity was the person who was responsible in the back part of the shop, the one that was fixing the bikes and telling who is responsible to put this bike in the window actually wrote a check for 400 dollars to Zane reflecting that it was his responsibility. So that’s a real test of culture and in his business he talks a lot of his staff about the life time value of the customer and that the customer if they coming for 1 bike is worth to the business 800 dollars but if they are life time customer they will buy 7 or 8 bike in their lifetime and that will be worth 25-30k dollars so the whole thing around customer centricity in the Zane business was doing things like that and having a culture where everybody in the business understood it and then creating a measurement tool that says customer is important not only because we like this people but because they really create profitability for the business and this business is been continually growing over the last 20 years. Mel: Yeah fantastic story. Really amazing. The tapping in as you said and the emotional side of things but the empathy of there was a lot of effort put into coordinating and requesting that might be put in the window so we didn’t deliver on that so let’s make it right and completely turn around negative into not even neutral but sounds like a positive. Linden: Well definitely this person would be an advocate and he has been able to create the staff and also the link between the wellbeing of the customer with the wellbeing of the business and there is not a transaction when we are dealing with the customer but it is the relationship. Mel: Yes and the fact that the employee actually fronted out with the check speaks volumes about it. It is clearly so ingrained in everything that they do that the employee knew that it is just no way around it and this is vitally important that how we believe the business should be run. Linden: What is interesting is that in Zane office you will see that check fined in his office wall. He didn’t have to cash the check. But it is almost a legendary story around business and that creates a lot of power I think. Mel: Absolutely speaks volumes. Now Linden you have got a great background of what led you to your business market strategies and also led you to writing your book. Can you have given us some background into how you ended up in writing a book and where this came from? Linden: You know my original was in finance and accounting but I was actually bought up in a family that led small business and so I was sort of tuned into the fact that business is much more than just about the money side of things and when my first job with Cadbury in Australia I worked with them in England and once when I was in England I came across a guy who is really an inspirational marketing and sales leader and I said to him look I need to know more about this part of business. What should I do? He said go and work in the supermarket and listen to customers, see what they do, how they behave and you learn a lot about what it means to understand customer needs and most important thing in business is really knowing about and being able to provide them with products and services that meet those needs really well. So I did that and that was really the start of my marketing experience I suppose because when I came back to Australia after that I then started to study marketing and get evolved in marketing education and also with one of two startups in Australia. Experiences what it was like to have customer to have problems in delivering value to them and work all out and so it was quite a long period of what I suppose experience in business generally but particularly with customers and also in studying it and teaching it in various universities. Now that led me to really knowing that the customers are really the center of your business because you don’t have anything and when I was doing a lot of this marketing consulting work and marketing education work in particular large companies in the US and other places, started to realize the cultural side of it is very important but if you didn’t have a culture that supported a market orientation in business which is building growth into your business and delivering value to customers and well then you really didn’t have an ability to be able to profitably grow that business over time so it let me put a small team together to study this area and to ask some key questions. One of them was is customer centricity actually important? Does it contribute towards building business profitability? And the second question was why companies aren’t as a majority customer centric? what is it that wrong because there is a research that is telling us that 90 percent of large companies in US believe they were customer focused but only 10 percent of customers actually agreed so huge gap and so this research was designed to answer those questions and the third one question was if it is important to be customer centric business. Can we actually measure it? Because we know if we can measure things we got better chance of improving them. So those 3 questions were really the ones we wanted to answer and they were raised by colleagues where one of the people that I know very well who is ahead of the finance group asked me those same questions and said why cannot I get more customers centric thinking to my group? And I tried but it really didn’t work and so this lead to these questions and as a result of that research we then wrote the book customer culture imperative which allowed us to outline a framework of what customer centricity is and make it tangible. We did find that there is elements of customer centricity to drive positive business performance if you are strong in those elements and we did therefore time when it is actually important for business. So we found that those business that were highly customer focused in what they did as a culture were much more profitable than the other businesses and there was a lot of evidence to actually support that. So that’s how the book really came across it about it and was probably research project. Mel: Can I ask Linden is consistency you said your friend that said I have been trying but I haven’t had any luck. Is it about I expect it is about long term approaches and I guess tweaking as you go right. Linden: It is. I think the first thing that a lot of leaders in small, medium, large business don’t understand is that to be customer centric you have to create a culture of customer centricity. You have to create a set of behaviors right across the entire business. Really everybody job is to make sure the value is delivered to customers in a way that makes advocates which creates loyalty and profitability for the business. So the long term aspect of this is very important because a lot of particularly necessarily running public corporations where quarter by quarter they are reporting to stockholders and if they missing their numbers they are getting tremendous criticism. The big advantage if you don’t have that short term pressure to meet numbers month by month but at the same to really build a strong customer culture you need to have a view that goes and investment really that goes beyond next month that is a thing you do overtime and probably one of the great examples of this is amazon, they sell virtually everything but the CEO of amazon has always taken a long term view and is always looking for ways to which greater value can be provided to their customers and that and he is actually taken in a 1000 year clock that he has in Texas where each year ticks on 1 second something like that but reminds him that business needs to be thought about beyond short term and building customer centric culture needs to be ongoing and we need longer term vision with that and he as a monthly newsletter that comes out to his shareholders and everyone them right from the beginning I think 1995 so they are company close to 20 years old but every one of them from start had the view that we need to have customer centric culture we need to take a long term view. 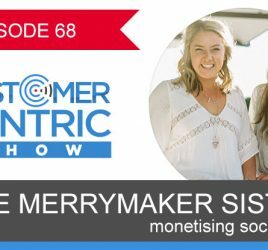 Mel: Yes absolutely I think when we were talking before we actually went live on episode about that perception of businesses already feeling like they are customer centric and you said before 90 percent of businesses actually believe they are but their customer say otherwise and I think what you are talking about is that culture element and the importance of looking into it before you can actually help customers. So do you mind explaining to us the tool the index that you developed? Linden: Yes from this research work we developed and elevated to which we call the market responsiveness index and it makes I think tangible a total of eight factors that seem to be drivers of future business performance that’s customer satisfaction and innovation. All those things can tied back to these 8 factors. So these 8 factors helped us really make this area of customer centric culture tangible. They really about what people do in the business. What people actually doing in relation to customers and we have 2 of those factors are customer factors and one we call customer insight and the other is customer foresight and those 2 factors are really ones where we are doing things in our business culturally right across the business that helps us in the case of customer insight going very in depth understanding of needs of our existing customer and how they like ot be served? And what is important and from that we are deliver that value in the way they want. Customer foresight is about the needs to future customers. So that picks up the future. We have 2 other factors which are competitor ones. Competitor insight is around the existing customers. How do we position ourselves to existing competitors because they represent the alternatives to our customers, they have options and the competitor companies are typically options? So competitor’s insight about existing competitors and foresight is about possible new competitors. Now who would have thought in the taxi industry 5 years ago that there would be an ember? So there is something that has come out of the blue and had a massive impact and that’s happening right across all companies. So future competitors that affect value your customer going to get are very important culturally. Examples are a lot of companies that has just not seen things coming. Probably good examples again might be census and yellow pages. They didn’t have culturally the ability to make the change enough. That really cost them. Mel: Is it just because they are such a big business or is it because our audience could move a bit faster? Linden: Well yeah size definitely pose a part because to embed an agility of culture a large business is a lot harder to do that smaller business. In business smaller, you can get everybody in the same run and over weekend you can say look this is what is happening. This is how we are going to approach it, what else can we do. Okay let's agree we are going to do these things lets go do it. So you can in smaller business really galvanize everybody. So as long as they got the mindset to be able to change and even in small business. Mel: Is it about being able to identify what you unique value is in the market compared to your competitors but not resting on that and making sure that you are keeping at rest of what is happening so that you can shift and allocate as you need to so you continue to be the rocket leader. Linden: It is exactly that Mel and I think that what it has to translate into though is actually the delivery of value so we create the value and maybe it is product or services and we understand what that is from innovating around the current future potential needs of customers but the delivery part of it and this is why everybody needs to evolve in the business because it is the cultural thing and there are parts of the business which can hold that back so if you get always incorrect bills from finance group and there is a problem in the customer's point of view. The value of diluted and you can see that coming from other functions as well. All these things have big effect on the delivery of value. So the cultural part of it is really around the ability of people to change some of the things they do to create and deliver better value or appropriate value for customers and their expectations change. Mel: Okay great. So first to customer insight, customer foresight and then was it the competitive analysis there? Linden: Yeah competitor insight which is really around uniqueness and differentiation of value propositions in relation to it and competitor foresight is around who is going to be our future most important competitors? Some of them exist and some of them don’t but with the diamond of change going on, the value can be delivered by other companies if we don’t know. Can really allow and make advantages. So another external factor to that is purified vision and that is the understanding of what is actually happening very broadly in terms of economic impacts, social impacts, all those broad external things that are affecting all businesses these days. Those things are little bit like when you go and have your eye tested and you are asked to push button up way up to the left and it is that wide angle view of what is actually going on and what might impact our business in the future and where it has become really highlighted is the move and technology towards mobile communications for sharing information and for banking everything and a lot of companies really relate to that particular boat. I was at Facebook the other day here at silicon valley and that is example of very customer centric organization probably about 4 years ago Mark Zuckerberg look our mobile application here in Facebook is just not good enough. We really got to change and invest in this because mobile is going to be future so for the millennium generation it is present so big companies like Facebook really are trying to shift if you like their capability to that technology and they done it reasonably well but there are still a lot of more that can actually be done so that is an example of an technological and customer shift that is going on and affecting most businesses and that’s a vision thing. We have company here in Silicon Valley called Intel and probably 10 years ago they said we got to start thinking mobility in terms of chips. He gave it right in the start and this is a big business intel and they took 5 years ago before culturally they make that shift and do it so they probably came back to it and big businesses versus small businesses and small businesses we had the great advantage of being able to get everybody into the work talk about it get everything think back and feed in and really make changes quickly. Mel: Just thinking Linden for my listeners who are small medium sized business owners, would there be an advantage to allocating a certain amount of time a week and talking about the things they are using or things they are seeing in their market just to keep their eye on competitors but also to be able to develop a bit of pattern of what you can see is where people are moving so that you can then start I guess keep close eye on what is happening and they able to pre-empt customer changes down the line. Linden: I think that’s a great advantage to do that what you suggested. I think that you could do that in a timely way with a smaller medium sized business and then you can have even special days once a quarter or something like that where you really spend quite a bit of time day or something like that really sympathizing the things coming through. So you can well put through together them in and really start to have developed strategy from strategy day where you actually bring that together for action. So first things can be tactical improvements. You can look for strategic improvements, taking out opportunities is a good idea. Mel: Hmm I am thinking as a leader when you are running all these elements of your business and delegate to certain degree, those are the things that we typically as business owners keep to ourselves and if we are able to have more mindful of thinking along those lines and be keeping an eye and here out, we would be much more likely to make a bigger gains and be more market aware I guess. Linden: You know quite a few years ago I was an owner and part with a furniture business which we started from scratch and still operates today but what is relevant about that is every Friday afternoon I would get all the staff together and we would talk about what is actually going on in the business and that was every Friday afternoon so we had people in there in the store and the office people and so on and out of that came tremendous initiatives and also tactical things to maintain competitive advantage so what you are suggesting is very valued. Mel: Hmm just having that transparency so people feel connectedness and that I guess ownership in what is happening. So Linden we have gone through first five. Linden: That’s right and then there are 3 others which are more in totally oriented things. The things we actually doing to make all of it to get real benefits out of first five and one of them is cross functional collaboration and that is the extent to which we work together across functions so this is the sales people working with your finance people closely and your operations people working with the HR people closely or the IT people so that we found cross function collaboration has enormous impact of your ability to deliver value and changes more quickly and much more efficiently. So when you collaborating functions you are not having duplications and you all on same page in terms of getting things done. So that’s number six. Seven in empowerments. So that’s really important. This I think is easier in smaller rather than bigger businesses to make sure that your staff are really feel that they can do the job without empowerment particularly for customers so in some businesses there are processes that really make it very difficult for you to help a customer so take a company like cocker we take one store in Sydney and a couple of stores in Melbourne. Now cocker really allows its staff and say look we have no return policy so people can bring something that they purchase and is wrong thing yeah we take that back. So what that does is they might be taking advantage of very small percentage customers but really it doesn’t affect the profitability of the business. What it does is for customers it is easy for them to do that if they made a mistake and for staff there is embarrassment. It is going to be a very pleasant building of relationship. If you ask somebody and I did in Sydney stores and this person was pushing trollies and getting all the trolleys from the car part and to the store and I asked what it is like to work for cocker and he said fantastic loved the company. We all know what is going on, we all can throw ideas for improvement. We know that’s a thing. So the final one of strategic alignment. You know what is important in small business is something you mentioned earlier that also leaders keep to themselves their vision is. But their staff don’t know. So what the bigger picture? What is our vision and actual strategy to achieve our goal? These things need to be made concrete for staff and when they know these things then you are much effective business. Where there is disconnect between leaders and staff, then you got ineffectiveness. It affects the customers and employee engagements. If they are inspired as people are, then really going to crusade to help you build your business and that’s the leader's responsibility and that is to create that strategic alignment. Mel: Yes and I think speaking of a lot of the business owners, the perception sometimes from the staff can be that or the feeling is that the staff believe that they are just in it for the money and there is no connection even though they see certain things in business by the owner I think it is money driven. So there is real value in sharing stories of how you led to start in that business and what drives you, I think that’s a way to engage your staff so they can actually see that there is purpose in what they are doing other than just the function they are employed to do. Linden: Absolutely. I was with a small business owner this morning. This guy runs a construction company in California and they have it is a medium size business but that business has been built around community involvement. This leader was telling me that he is on 7 non-profit boards and they contribute all kinds of things in which they operate. It came from the earthquake that affected their father hometown down the California and his father running this construction business and he said his father went in and fixed all the stuff you know. They built the broken building and didn’t charge anybody and he did because he had to do it and that kind of passion now reflects right through this business where the head of this company today is the son has got that customer centric community oriented belief and it translates into action. A lot of people have been working with 20 years and they all regarded as family. They know that he loves them and that he would do anything for them and so likewise they do anything for him. Mel: Absolutely. I think of a guest I had recently he is exactly the same and even my father who had an road building business, anytime anything happened people were in danger, he was there with his equipment and transport there to help them and that was just his initial reaction because he needed to help and that’s what you want to do as human being but as a side benefit he was known as a guy that stepped in when others didn’t I guess. Linden: He is exactly like the guy I spoke to today I mean very impressive and a profitable in growing business and they been going out for 37 years. That’s the sustained growth and profitability that they have generated over that time. Mel: Yeah fantastic I think the community building side of things I think there is a lot of talk around community building at the moment and it is about this online consecutiveness and it all comes down to helpfulness but actually being in your local community outside of online as well to be able to develop those relationships 100 percent. Now Linden before we wrap up I just want to know can you give us some examples of how this process of being able to look out internally and externally to be able to actually give the results of increasing customers, profitability and then step further being able to have more freedom in your life so you are not in your business completely 24/7. Linden: Yes well I think coming back to the market responsiveness index. I see that as a starting point for those business owners that really want to find out to what level of customer centric because there are strength and weaknesses across eight things we talked about and they will firstly then benchmark companies on those 8 things and then point out from experience from other companies. What you need to be doing if you are weak in strategic alignment? There will be some specific things to do and really developed a roadmap of fairly common sense steps that you can take to build strength in customer culture in your business and the starting point I think is the measure and if we look at some companies that had been able to do this, what they have done is made its commitment to say firstly yes we want to build strength of our customer culture because we know when we do that we are going to be more profitable and grow more and in fact we get a lot less mistakes in our business so we going to have employees that more engaged and that means me as a business owner can be much more relaxed as well. So if I got strength in those various elements that we talked about, I would have a business that is running much more smoothly. There is always headaches in business. So all of these things lead to a more profitable business for everybody because everybody is passionate about these sort of things. One example I think of is MRI market responsive index health check in the businesses where it has customers and actually a finance business and for small business only 20 people in it and they have various kinds of finance products and they were having a problem in creating focus in their business so the normal functions in the people so you have finance people and somebody doing operations and somebody with legal contracts and so on. 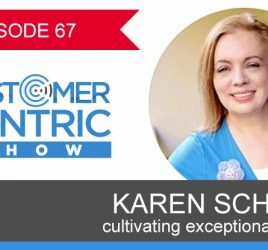 But they had trouble in getting focus and what this actually did for them was to create focus around the customer for everybody and they implemented is what I call customer immersion program. So particularly got people in that business involved in communicating with customers when a particular service was provided and ask them how the service went so not from the service person but maybe from the finance person made that particular call. So you are getting people that normally are not communicated with customers actually communicating with them and getting feedback and being able to come to the party when go to the meeting and say what do we know about their customers? Everybody got a contribution they can make once you get them involved in customer immersion approach but to do it well you need to have a plan to actually do it and then have feedback sessions and might actually fix in with suggestions and about getting together weekly or monthly to talk about what is happening with customers. If you feedback with this customer contact. Everybody at small business come at you. So that’s an element that has worked well in the business. Mel: When you got staff providing feedback for other staff, how do you do that to maintain relationships? How can you do that in a professional way that make sure that people are still getting along well? Is that an issue or not? Linden: It is an issue and I actually did an interview with Deyan Henry who is a former rugby coach and I asked him the tension associated with feedback just like that and he said in every meeting they had a session which they refer to as enter the danger which was really a session where you say look if you really got to drive somebody, this is time and meeting where we bring back into the open and we talk about it and expose it and get it done and clarify that and get everybody out there. But in their case they made it explicit so that plan is part of the meeting. We are entering danger okay. What needs to be said? Hah. Mel: Fantastic. I think those things are absolutely common features but when I speak to business owners who are doing really well, they are actually allocating that time and people say well that’s expensive with all those people especially if that’s the model you got casual employees. It is really about looking at it from broader picture isn't it and making sure that you are actually moving in the direction you want to otherwise faster to put out more things to manage. Linden: I mean the benefits of really having a customer centric culture exist for the individual and team in the business and owner and also business itself in terms of its performance so there are multiple benefits from putting the time and making key part of your strategy. Mel: Hmm and as you book outlines, it led these businesses as you refer to amazon it is because they have been able to get to that level because they are focusing on these things and they got that long term approach. Linden thanks so much for your time today. I am going to direct everyone to read the book customer culture and imperative. Your book with Chris. Can you please share with us where people can find more information about the book? Linden: Yes Mel. The information about our business is at marketculture.com and they are on that website, you will be able to get copy of the first chapter in your book and then in terms of getting hold of the book, it is available as an eBook or physical book and it can be obtained any of the mimics stores in Australia and can be obtained online from McGrawHill.com.au and I would think from couple of big book shops there deluxe and might be book world, I think you will find availability of the book and they can send it in either mode from their website. Mel: Excellent. Thank you so much for you time Linden. I have loved chatting with you and there is so much in there that’s people can follow these steps that are outlined in your book that will help move the culture into more positive way that will allow us more freedom in our businesses and really make sure we getting places. Thanks again Linden. Linden: Great pleasure. Thanks Mel. Linden Brown is a Professor, keynote speaker and author who works with businesses around the world to improve competitiveness through the adoption of market-centric values, practices and skills. Linden’s business MarketCulture Strategies offers benchmarking, skills assessment and strategic planning for teams that results in measurable improvements in sales growth, profitability and customer satisfaction. Linden is also the author of ‘The Customer-Culture Imperative’, a book that won Marketing Book of the Year 2015 – and it’s a book that unlocks the secrets used by businesses like Amazon, Virgin, Apple, Starbucks, and salesforce.com. It creates a guide for success based on three years of scientific study drawing insights from more than 100 businesses to identify seven key factors for success.